A vowel is one of the two principal classes of speech sound, the other being a consonant. Vowels vary in quality, in loudness and also in quantity (length). They are usually voiced, and are closely involved in prosodic variation such as tone, intonation and stress. Vowel sounds are produced with an open vocal tract. The word vowel comes from the Latin word vocalis, meaning “vocal” (i.e. relating to the voice). In English, the word vowel is commonly used to refer both to vowel sounds and to the written symbols that represent them. In the phonetic definition, a vowel is a sound, such as the English “ah” /ɑː/ or “oh” /oʊ/, produced with an open vocal tract; it is median (the air escapes along the middle of the tongue), oral (at least some of the airflow must escape through the mouth), frictionless and continuant. There is no significant build-up of air pressure at any point above the glottis. This contrasts with consonants, such as the English “sh” [ʃ], which have a constriction or closure at some point along the vocal tract. In the phonological definition, a vowel is defined as syllabic, the sound that forms the peak of a syllable. A phonetically equivalent but non-syllabic sound is a semivowel. In oral languages, phonetic vowels normally form the peak (nucleus) of many or all syllables, whereas consonants form the onset and (in languages that have them) coda. Some languages allow other sounds to form the nucleus of a syllable, such as the syllabic (i.e., vocalic) l in the English word table [ˈtʰeɪ.bl̩] (when not considered to have a weak vowel sound: [ˈtʰeɪ.bəl]) or the syllabic r in the Serbo-Croatian word vrt [ʋr̩̂t] “garden”. The phonetic definition of “vowel” (i.e. a sound produced with no constriction in the vocal tract) does not always match the phonological definition (i.e. a sound that forms the peak of a syllable). The approximants [j] and [w] illustrate this: both are without much of a constriction in the vocal tract (so phonetically they seem to be vowel-like), but they occur at the onset of syllables (e.g. in “yet” and “wet”) which suggests that phonologically they are consonants. A similar debate arises over whether a word like bird in a rhotic dialect has an r-colored vowel /ɝ/ or a syllabic consonant /ɹ̩/. The American linguist Kenneth Pike (1943) suggested the terms “vocoid” for a phonetic vowel and “vowel” for a phonological vowel, so using this terminology, [j] and [w] are classified as vocoids but not vowels. However, Maddieson and Emmory (1985) demonstrated from a range of languages that semivowels are produced with a narrower constriction of the vocal tract than vowels, and so may be considered consonants on that basis. Nonetheless, the phonetic and phonemic definitions would still conflict for the syllabic /l/ in table, or the syllabic nasals in button and rhythm. X-rays of Daniel Jones’ [i, u, a, ɑ]. 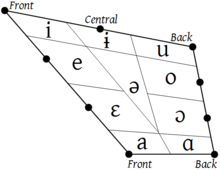 The original vowel quadrilateral, from Jones’ articulation. The vowel trapezoid of the modern IPA, and at the top of this article, is a simplified rendition of this diagram. The bullets are the cardinal vowel points. (A parallel diagram covers the front and central rounded and back unrounded vowels.) The cells indicate the ranges of articulation that could reasonably be transcribed with those cardinal vowel letters, [i, e, ɛ, a, ɑ, ɔ, o, u, ɨ], and non-cardinal [ə]. If a language distinguishes fewer than these vowel qualities, [e, ɛ] could be merged to [e], [o, ɔ] to [o], [a, ɑ] to [a], etc. If a language distinguishes more, [ɪ] could be added where the ranges of [i, e, ɨ, ə] intersect, [ʊ] where [u, o, ɨ, ə] intersect, and [ɐ] where [ɛ, ɔ, a, ɑ, ə] intersect. 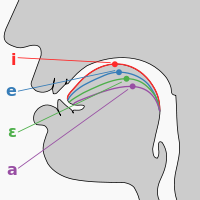 The traditional view of vowel production, reflected for example in the terminology and presentation of the International Phonetic Alphabet, is one of articulatory features that determine a vowel’s quality as distinguishing it from other vowels. Daniel Jones developed the cardinal vowel system to describe vowels in terms of the features of tongue height (vertical dimension), tongue backness (horizontal dimension) and roundedness (lip articulation). These three parameters are indicated in the schematic quadrilateral IPA vowel diagram on the right. There are additional features of vowel quality, such as the velum position (nasality), type of vocal fold vibration (phonation), and tongue root position. Different kinds of labialization are possible. 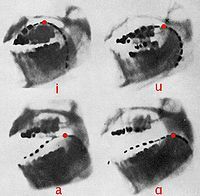 In mid to high rounded back vowels the lips are generally protruded (“pursed”) outward, a phenomenon known as exolabial rounding because the insides of the lips are visible, whereas in mid to high rounded front vowels the lips are generally “compressed” with the margins of the lips pulled in and drawn towards each other, a phenomenon known as endolabial rounding. However, not all languages follow that pattern. Japanese /u/, for example, is an endolabial (compressed) back vowel, and sounds quite different from an English exolabial /u/. Swedish and Norwegian are the only two known languages in which the feature is contrastive; they have both endo- and exo-labial close front vowels and close central vowels, respectively. In many phonetic treatments, both are considered types of rounding, but some phoneticians do not believe that these are subsets of a single phenomenon and posit instead three independent features of rounded (exolabial) and compressed (endolabial) and unrounded. The lip position of unrounded vowels may also be classified separately as spread and neutral (neither rounded nor spread). Others distinguish compressed rounded vowels, in which the corners of the mouth are drawn together, from compressed unrounded vowels, in which the lips are compressed but the corners remain apart as in spread vowels. Rhotic vowels are the “R-colored vowels” of American English and a few other languages. Unlike the other features of vowel quality, tenseness is only applicable to the few languages that have this opposition (mainly Germanic languages, e.g. English), whereas the vowels of the other languages (e.g. Spanish) cannot be described with respect to tenseness in any meaningful way. In discourse about the English language, “tense and lax” are often used interchangeably with “long and short”, respectively, because the features are concomitant in the common varieties of English. This cannot be applied to all English dialects or other languages. The first formant, abbreviated “F1”, corresponds to vowel openness (vowel height). 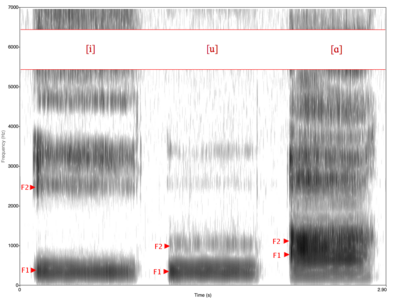 Open vowels have high F1 frequencies, while close vowels have low F1 frequencies, as can be seen in the accompanying spectrogram: The [i] and [u] have similar low first formants, whereas [ɑ] has a higher formant. In the third edition of his textbook, Peter Ladefoged recommended using plots of F1 against F2 – F1 to represent vowel quality. However, in the fourth edition, he changed to adopt a simple plot of F1 against F2, and this simple plot of F1 against F2 was maintained for the fifth (and final) edition of the book. Katrina Hayward compares the two types of plots and concludes that plotting of F1 against F2 – F1 “is not very satisfactory because of its effect on the placing of the central vowels”, so she also recommends use of a simple plot of F1 against F2. In fact, this kind of plot of F1 against F2 has been used by analysts to show the quality of the vowels in a wide range of languages, including RP, the Queen’s English, American English, Singapore English, Brunei English, North Frisian, Turkish Kabardian, and various indigenous Australian languages. Pitch: in the case of a syllable such as ‘cat’, the only voiced portion of the syllable is the vowel, so the vowel carries the pitch information. This may relate to the syllable in which it occurs, or to a larger stretch of speech to which an intonation contour belongs. In a word such as ‘man’, all the segments in the syllable are sonorant and all will participate in any pitch variation. A vowel sound whose quality does not change over the duration of the vowel is called a monophthong. Monophthongs are sometimes called “pure” or “stable” vowels. A vowel sound that glides from one quality to another is called a diphthong, and a vowel sound that glides successively through three qualities is a triphthong. The name “vowel” is often used for the symbols that represent vowel sounds in a language’s writing system, particularly if the language uses an alphabet. In writing systems based on the Latin alphabet, the letters A, E, I, O, U, Y, W and sometimes others can all be used to represent vowels. However, not all of these letters represent vowels in all languages, or even consistently within one language (some of them, especially W and Y, are also used to represent approximants). Moreover, a vowel might be represented by a letter usually reserved for consonants, or a combination of letters, particularly where one letter represents several sounds at once, or vice versa; examples from English include igh in “thigh” and x in “x-ray”. In addition, extensions of the Latin alphabet have such independent vowel letters as Ä, Ö, Ü, Å, Æ, and Ø. The phonetic values vary considerably by language, and some languages use I and Y for the consonant [j], e.g., initial I in Italian or Romanian and initial Y in English. In the original Latin alphabet, there was no written distinction between V and U, and the letter represented the approximant [w] and the vowels [u] and [ʊ]. In Modern Welsh, the letter aW represents these same sounds. Similarly, in Creek, the letter V stands for [ə]. There is not necessarily a direct one-to-one correspondence between the vowel sounds of a language and the vowel letters. Many languages that use a form of the Latin alphabet have more vowel sounds than can be represented by the standard set of five vowel letters. In English spelling, the five letters A E I O and U can represent a variety of vowel sounds, while the letter Y frequently represents vowels (as in e.g., “gym”, “happy“, or the diphthongs in “cry“, “thyme”); W is used in representing some diphthongs (as in “cow“) and to represent a monophthong in the borrowed words “cwm” and “crwth” (sometimes cruth). It is not straightforward to say which language has the most vowels, since that depends on how they are counted. For example, long vowels, nasal vowels, and various phonations may or may not be counted separately; indeed, it may sometimes be unclear if phonation belongs to the vowels or the consonants of a language. If such things are ignored and only vowels with dedicated IPA letters (‘vowel qualities’) are considered, then very few languages have more than ten. The Germanic languages have some of the largest inventories: Standard Danish has 11 to 13 short vowels (/(a) ɑ (ɐ) e ə ɛ i o ɔ u ø œ y/), while the Amstetten dialect of Bavarian has been reported to have thirteen long vowels: /iː yː eː øː ɛː œː æː ɶː aː ɒː ɔː oː uː/. The situation can be quite disparate within a same family language: Spanish and French are two closely related Romance languages but Spanish has only five pure vowel qualities, /a, e, i, o, u/, while classical French has eleven: /a, ɑ, e, ɛ, i, o, ɔ, u, y, œ, ø/ and four nasal vowels /ɑ̃/, /ɛ̃/, /ɔ̃/ and /œ̃/. The Mon–Khmer languages of Southeast Asia also have some large inventories, such as the eleven vowels of Vietnamese: /i e ɛ ɐ a ə ɔ ɤ o ɯ u/. Wu dialects have the largest inventories of Chinese; the Jinhui dialect of Wu has also been reported to have eleven vowels: ten basic vowels, /i y e ø ɛ ɑ ɔ o u ɯ/, plus restricted /ɨ/; this does not count the seven nasal vowels. The word and frequently contracts to a simple nasal ’n, as in lock ‘n key [ˌlɒk ŋ ˈkiː]. Words such as will, have, and is regularly contract to ’ll [l], ’ve [v], and ‘s [z]. However, none of them are pronounced alone without vowels, so they are not phonological words. Onomatopoeic words that can be pronounced alone, and that have no vowels or ars, include hmm, pst!, shh!, tsk!, and zzz. As in other languages, onomatopoeiae stand outside the normal phonotactics of English. There are other languages that form lexical words without vowel sounds. In Serbo-Croatian, for example, the consonants [r] and [rː] (the difference is not written) can act as a syllable nucleus and carry rising or falling tone; examples include the tongue-twister na vrh brda vrba mrda and geographic names such as Krk. In Czech and Slovak, either [l] or [r] can stand in for vowels: vlk [vl̩k] “wolf”, krk [kr̩k] “neck”. A particularly long word without vowels is čtvrthrst, meaning “quarter-handful”, with two syllables (one for each R). Whole sentences can be made from such words, such as Strč prst skrz krk, meaning “stick a finger through your neck” (follow the link for a sound file), and Smrž pln skvrn zvlhl z mlh “A morel full of spots wetted from fogs”. (Here zvlhl has two syllables based on L; note that the preposition z consists of a single consonant. Only prepositions do this in Czech, and they normally link phonetically to the following noun, so do not really behave as vowelless words.) In Russian, there are also prepositions that consist of a single consonant letter, like k “to”, v “in”, and s “with”. However, these forms are actually contractions of ko, vo, and so respectively, and these forms are still used in modern Russian before words with certain consonant clusters for ease of pronunciation. In Southern varieties of Chinese, such as Cantonese and Minnan, some monosyllabic words are made of exclusively nasals, such as [m̩˨˩] “no” and [ŋ̩˩˧] “five”. So far, all of these syllabic consonants, at least in the lexical words, have been sonorants, such as [r], [l], [m], and [n], which have a voiced quality similar to vowels. (They can carry tone, for example.) However, there are languages with lexical words that not only contain no vowels, but contain no sonorants at all, like (non-lexical) shh! in English. These include some Berber languages and some languages of the American Pacific Northwest, such as Nuxalk. An example from the latter is scs “seal fat” (pronounced [sxs], as spelled), and a longer one is clhp’xwlhtlhplhhskwts’ (pronounced [xɬpʼχʷɬtʰɬpʰɬːskʷʰt͡sʼ]) “he had had in his possession a bunchberry plant”. (Follow the Nuxalk link for other examples.) Berber examples include /tkkststt/ “you took it off” and /tfktstt/ “you gave it”. Some words may contain one or two consonants only: /ɡ/ “be”, /ks/ “feed on”. (In Mandarin Chinese, words and syllables such as sī and zhī are sometimes described as being syllabic fricatives and affricates phonemically, /ś/ and /tʂ́/, but these do have a voiced segment that carries the tone.) In the Japonic language Miyako, there are words with no voiced sounds, such as ss ‘dust’, kss ‘breast/milk’, pss ‘day’, ff ‘a comb’, kff ‘to make’, fks ‘to build’, ksks ‘month’, sks ‘to cut’, psks ‘to pull’. However, vowel sequences in hiatus are more freely allowed in some other languages, most famously perhaps in Bantu and Polynesian languages, but also in Japanese and Finnic languages. In such languages there tends to be a larger variety of vowel-only words. In Swahili (Bantu), for example, there is aua ‘to survey’ and eua ‘to purify’ (both three syllables); in Japanese, aoi 青い ‘blue/green’ and oioi 追々 ‘gradually’ (three and four syllables); and in Finnish, aie ‘intention’ and auo ‘open!’ (both two syllables), although some dialects pronounce them as aije and auvo. Hawaiian, and the Polynesian languages generally, have unusually large numbers of such words, such as aeāea (a small green fish), which is three syllables: ae.āe.a. Most long words involve reduplication, which is quite productive in Polynesian: ioio ‘grooves’, eaea ‘breath’, uaua ‘tough’ (all four syllables), auēuē ‘crying’ (five syllables, from uē (uwē) ‘to weep’), uoa or uouoa ‘false mullet’ (sp. fish, three or five syllables). The longest continuous vowel sequence is in Finnish word hääyöaie (“wedding night intention”). ^ According to Peter Ladefoged, traditional articulatory descriptions such as height and backness “are not entirely satisfactory”, and when phoneticians describe a vowel as high or low, they are in fact describing an acoustic quality rather than the actual position of the tongue. ^ “Vowel”. Online Etymology dictionary. Retrieved 12 April 2012. ^ Cruttenden, Alan (2014). Gimson’s Pronunciation of English (Eighth ed.). Routledge. p. 27. ISBN 9781444183092. ^ Cruttenden, Alan (2014). Gimson’s Pronunciation of English (Eighth ed.). Routledge. p. 53. ISBN 9781444183092. ^ Ladefoged, Peter; Maddieson, Ian (1996). The Sounds of the World’s Languages. Oxford: Blackwell. p. 323. ISBN 0-631-19814-8. ^ Deterding, David (1997). “The formants of monophthong vowels in Standard Southern British English Pronunciation”. Journal of the International Phonetic Association. 27 (1–2): 47–55. doi:10.1017/S0025100300005417. ^ Hawkins, Sarah and Jonathan Midgley (2005). “Formant frequencies of RP monophthongs in four age groups of speakers”. Journal of the International Phonetic Association. 35 (2): 183–199. doi:10.1017/S0025100305002124. ^ Harrington, Jonathan, Sallyanne Palethorpe and Catherine Watson (2005) Deepening or lessening the divide between diphthongs: an analysis of the Queen’s annual Christmas broadcasts. In William J. Hardcastle and Janet Mackenzie Beck (eds.) A Figure of Speech: A Festschrift for John Laver, Mahwah, NJ: Lawrence Erlbaum, pp. 227-261. ^ Flemming, Edward and Stephanie Johnson (2007). “Rosa’s roses: reduced vowels in American English” (PDF). Journal of the International Phonetic Association. 37: 83–96. CiteSeerX 10.1.1.536.1989. doi:10.1017/S0025100306002817. ^ Deterding, David (2003). “An instrumental study of the monophthong vowels of Singapore English”. English World-Wide. 24: 1–16. doi:10.1075/eww.24.1.02det. ^ Salbrina, Sharbawi (2006). “The vowels of Brunei English: an acoustic investigation”. English World-Wide. 27 (3): 247–264. doi:10.1075/eww.27.3.03sha. ^ Bohn, Ocke-Schwen (2004). “How to organize a fairly large vowel inventory: the vowels of Fering (North Frisian)” (PDF). Journal of the International Phonetic Association. 34 (2): 161–173. doi:10.1017/S002510030400180X. ^ Gordon, Matthew and Ayla Applebaum (2006). “Phonetic structures of Turkish Kabardian” (PDF). Journal of the International Phonetic Association. 36 (2): 159–186. CiteSeerX 10.1.1.233.1206. doi:10.1017/S0025100306002532. ^ Audio recordings of selected words without vowels can be downloaded from “Archived copy”. Archived from the original on 2009-03-20. Retrieved 2009-06-19. CS1 maint: Archived copy as title (link). Lindau, Mona. (1978). “Vowel features”. Language. 54 (3): 541–563. doi:10.2307/412786. JSTOR 412786. Stevens, Kenneth N. (2000). “Toward a model for lexical access based on acoustic landmarks and distinctive features”. The Journal of the Acoustical Society of America. 111 (4): 1872–1891. doi:10.1121/1.1458026. PMID 12002871. Vowels and Consonants Online examples from Ladefoged’s Vowels and Consonants, referenced above.